Tim Reed came out of the water fourth but fought back to complete his golden treble. 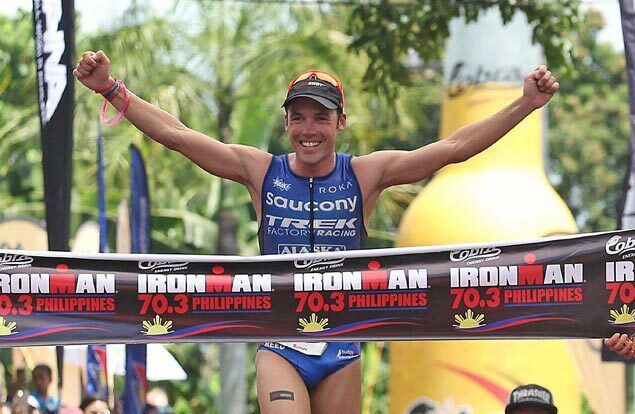 AUSTRALIA’s Tim Reed pulled off a rare triple while Amelia Watkinson of New Zealand shared the limelight in the Ironman 70.3 Philippines at the Shangri-La's Mactan Resort and Spa. Tragedy marred the ninth staging of the 1.9k swim-90k bike-21k run event as one of the participants died during the swim stage after apparently suffering from heart attack. In an official statement, Ironman Philippines confirmed the incident, saying that the triathlete required medical attention in the swim part of the race and was transported to a nearby hospital. “We are deeply saddened to confirm the death of one of our athletes following the IRONMAN 70.3 Philippines in Cebu. The athlete required medical attention during the swim portion of Sunday’s race and was properly transported to a nearby hospital where they were treated. Our condolences go out to the athlete’s family and friends, whom we will continue to support,” said the statement. In 2012, a biker fell and hit his head on the gutter and died of sudden blood clots in the lungs. Reed came out of the water fourth and fought back to complete his golden treble. "Every win is different. This is a really pleasing result for me because I worked really hard for this," said Reed, who clocked 3:54:07 to beat Mauricio Mendez of Mexico by more than two minutes. "I knew I was very fit and I knew I'd have a good chance. If somebody else beat me but I put in a really good performance, I'm okay with that. Today (yesterday) was just all about focusing on myself and racing as hard as I could," he added. Mendez wound up second place in 3:56:46 while early pacesetter Ryan Fisher, also from Australia, settled for third in 4:00:20. Watkinson clocked 4:29:17, six minutes and thirty-six seconds ahead of Jacqueline Thistleton in a big improvement to her sixth place finish in last year’s Asia-Pacific Championship. Kerry Morris of Australia came in third in 4:39:11. "I was sixth last year. You always take something from the bad races so it's not a hindrance to come back and try to be better," said Watkinson. Fil-Am Kim Kilgroe settled for seventh in 4:58:58.